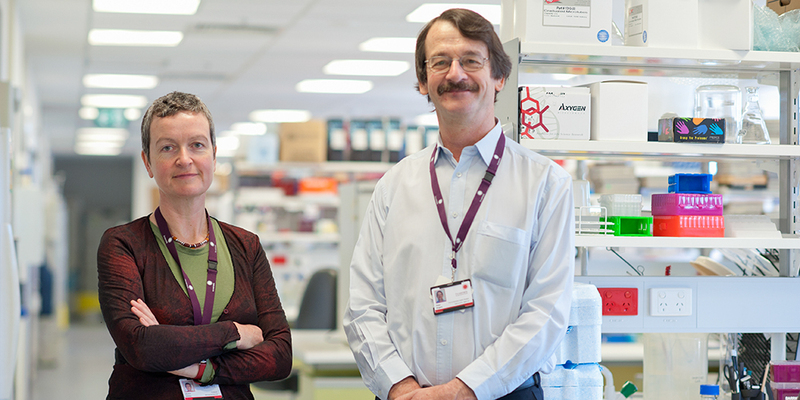 Professors Martha Hickey and Peter Rogers, leaders of the Women’s Gynaecology Research Centre. A very generous bequest from the estate of Ilma Mary Short enabled the Women’s to establish The Gynaecology Research Centre. It is the first centre in Australia to bring together clinical and laboratory expertise to investigate a wide range of common gynaecology issues including menopause, early menopause after cancer treatment, heavy and abnormal menstrual bleeding, endometriosis and sexual health dysfunction due to cancer. This specialist research centre will help the Women’s improve the care of many Australian women who suffer from debilitating gynaecological conditions. Ilma Mary Aitken was born in 1917, the second child of a railway worker and his wife who lived in Casterton in Western Victoria. The family moved to Kensington in Melbourne when Ilma and her sister were still young, and they established themselves as part of the large North Melbourne railway community and were strong members of the Presbyterian Church. Relative to many in Kensington at the time, their family was prosperous. Her father Charlie, had a stable job at the railways, and was an enterprising worker, fixing up old houses. During the depression years, local people would come to the back door to collect soup from the large pot that Mary, Ilma’s mother, had made to feed those in need. Prosperity and security all changed for Ilma when her beloved older sister died in 1941, having been struck down by a motorcycle. The family unit disintegrated and Ilma and her mother, then penniless, moved to a house in McKinnon, purchased with a loan from a church housing charity. Ilma found a job in a toy warehouse and Mary took in sewing to pay back the loan. After a hard start, with determination and hard work they created a happy life for themselves. In about 1943 Ilma took a job at the CSIRO in East Melbourne. She thrived working as a clerk for this leading scientific institution and was fascinated by the work and research undertaken. It was here that she met Jim Short. They married in 1974 and Ilma finally retired in 1978. Jim was a keen investor, and through his great interest and foresight in financial trends helped Ilma grow a strong investment portfolio. Despite amassing significant wealth both Ilma and Jim were very cautious spenders. However, they were also generous and forward-thinking. In mid 2008 the Women’s received just over $580,000, left as a bequest by Ilma. This very generous gift from her estate made it possible for the hospital to establish the Women’s Gynaecological Research Centre and staff it with leaders in their field. This wonderful new facility was officially launched in July 2012, thanks to Ilma and her belief in scientific research and her strong desire to give something back to society. The specialist research that can now be undertaken will significantly benefit patients now and well into the future.